You need an organic wool pillow from Savvy Rest. Every night I lay down on my Organic Shredded Latex Pillow and I sleep soundly. It is definitely the best pillow I ever had and I hope it lasts me forever! If you remember I reviewed it back in February. Check it out because you will want one too! This month we are reviewing the Organic Wool Pillow from Savvy Rest. You notice that I said ‘we’ because this has become Hubby’s pillow. Lucky guy! 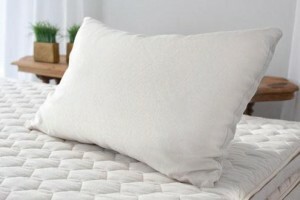 If you sleep hot, you’ll appreciate how this pillow’s organic wool fill helps stabilize your temperature. Wool fiber is a natural insulator (from heat or cold) and improves air flow. Wool also promotes moisture evaporation for drier, cooler comfort. Synthetic fillings and polyester fabrics are manufactured from petrochemicals, which can cause gas toxins and sensitivity-causing fumes. Down/feather pillows harbor dust mites and cause allergic reactions in many people. Nasty? Wonder if you had health issues already? You’re just making it worse when you sleep. We spend a third of our day in bed. We want to be breathing in fresh air to prepare our body for the next day. It’s just healthier! Plus we sleep BETTER knowing that we are SAFER! WIN an Organic Wool Pillow & start sleeping organic! Find the pillow on Amazon. Savvy Rest sent me this organic wool pillow for review. I was not compensated in any way and all opinions are my own. I absolutely LOVE wool, its THE ultimate natural fabric. I'd be in heaven with an organic wool pillow!!! Wool is great material - never thought about having it in my pillow. Before i became a cloth diapering mama i never knew how wonderful wool was. Now i cant get enough of it. would love a new pillow! I am dying to find a good pillow. maybe this would be it ?!? I have heard so many great reviews about Savvy Rest, and I have wanted to try their products for a long time. I think this would be a great idea for my mom, who really suffers with allergies. My husband has allergies that are exacerbated by dust. We should really try one of these out for him. Bit by bit I'm trying to move towards using more natural products in and around our home. I would love to try a new pillow. My husband is pretty finicky about his, so between the two of us (or our houseful of kiddos) someone is sure to love a new type of pillow. never heard of a wool pillow...sounds nice and warm! if its important for babes to have organic mattresses, it would make sense we probably ought to at least use organic pillows ourselves!! I love wool and I would love to have a great pillow like this. Thanks for the giveaway! Really need a good pillow! I am in search of a new fantastic pillow. I have never used a wool pillow. This one sounds amazing. I can't ever get my pillow to feel right when it is a synthetic or foam pillow. I love down, but it is very expensive. I'd really love to try a wool pillow! I have to say this is the first time I've thought about wool OR organic sleeping---sounds like something great, though! One of the things I like is the natural wicking away of moisture and I really love the warmth of wool. I like the drier, cooler comfort factor. I'm hot all the time at this point in my life, so a wool pillow sounds great! The hubby could use this! I have always liked a feather pillow, but did find I breath better not using it anymore. Maybe the hubby wouldn't get it if I won! I would love to try this. I haven't had much luck with pillows, they tend to flatten and cause neck discomfort through the night. There are so many mornings when I wake up and my neck hurts. I know it's my pillow and would love to try one of these. Thank you! I think a comfortable pillow is a must for a good nights sleep. I would love to win this! I'm a huuuge wool fan! Wool blankets, wool rugs, wool diaper covers and... maybe a pillow?! I've never heard of a wool pillow but I have heard of cotton/wool blend beds. I'd love a new pillow, I've been washing and re-fluffing the same one for 2 years now. A good pillow is very important for me! I have neck problems and have a very hard time finding a good pillow. I love that this is wool and organic at that! I would love to try this! i have been looking for a better pillow forever! Does one really exist?? Would love to try this one for sure! I have been trying to win one of these for months! I love comfy pillows and mine is starting to deteriorate!! I love that the wool pillow will help stabilize your temperature as you sleep, especially if you get hot at night. I love wool, I am allergic to down so would love to have a wool pillow. I'd like to try one of these because it's hard for me to find a pillow that I like. I love the temperature part about it because I always love my pillow cool. I hate when it's so hot that I can't sleep. I have really been making an effort to keep all of our bedding organic. I don't know if it is better in particular, but for some reason I seem to sleep better. I would love a non-synthetic pillow to sleep on. Thanks for the great giveaway! I think that this pillow would be a great upgrade from my current pillow! I would love to try a wool pillow! I love that it is organic and that it is breathable...I love a cool pillow, especially since we live in a desert climate! I love the idea of wool for both heat & coolness. I think that an all natural pillow is awesome and you are telling me it's organic? I'm in heaven! This sounds very comfortable and would love a new pillow as I am over 8 months pregnant! I'd love to own a wool pillow. Sounds very comfortable! organic sleeping is expensive but soooo important! my husband and i have latex pillows but my daughter is sleeping on our old ones... i'd love to give her a new wool pillow! My husband would love this, as he is too warm when he sleeps and needs multiple pillows to stay cool, this would be perfect. Never tried a wool pillow before. sounds amazing... there is so much crap stuffed in pillows!! I just think it'll make 5 hours of sleep feel like a full 8. I want one of these wool pillows so bad! I have never had a GOOD pillow! I always buy the cheap $5-10 pillows at Walmart! we just got an organic matress & boxspring so we've been looking for a good solution to "green" our pillows. these look great! They sound really nice. I'd like to give this to my best friend who could really use a good new pillow. I would love to have this! It sounds wonderful! I have a hard time sleeping with a lot of pain with Fibromyalgia and Lyme Disease. This pillow looks like it's just what the doctor orders. Thanks for a great giveaway! I would love this pillow! My fiance and I have gone through so many looking for a great pillow - this could be it! We just bought a latex mattress so these would be a great addition. We have been trying to slowly add organic sleeping gear to our home. My youngest son has an organic mattress and they sleep on organic sheets. I would love a pillow to start in my room! I think this organic pillow would be awesome for my husband, he always sleeps "hot" and I think his head would enjoy it. I am so excited about this pillow! I'd love to win! I've been dying to get my hands on an organic wool pillow. 5 years ago we invested in an organic mattress - and it was well worth it. I love organic wool, now! I really need a new pillow & this one sounds amazing. this would look great on my bed! I have never heard of a wool pillow! I could use a new one pillow too! It sounds like something my husband would really enjoy. I'm wondering if the Savvy Rest Organic Wool Pillow is machine washable ãƒ… *Thanks* for the giveaway! I have allergies and asthma, so I use slot on organic bedding. Aim hopping that this adds to a better sound sleep. I would be interested in trying wool pillows. It looks soft and comfortable and would really help me sleep better. I am always looking to try a better pillow, and I think this is a good product. I would love to try their products. They look to be of high quality. I would love to try this pillow and see if I can sleep better with it! I've never thought about "organic" sleeping before, but I can see the positives...would love to try the pillow. I really think this is fantastic as I try to go as natural as possible. Love wool and wish things like wool clothing, real felt, etc. were easier and cheaper to come by. spcale at yahoo dot com. How cool! What better way to sleep than on an organic pillow. I would love to try an organic pillow. Sounds like a great pillow.